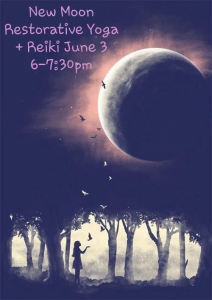 Combining Reiki and restorative yoga creates a beautiful opportunity for one to reconnect with themselves on a deeper level while embracing intense feelings of relaxation within. Reiki is a Japanese energy healing technique that promotes stress reduction and relaxation. Reiki helps remove blockages in the energy field and creates space within for improved clarity, comfort, and calm. Energy healing goes beyond the physical body and facilitates healing by clearing blocks in the energy fields and repairing and rebalancing the individual’s energy so the body can access its own innate healing ability. Intuitive readings provide insight into the deeper levels of consciousness, accessing wisdom and advice from one’s own energy field to aid in one’s life journey. Reiki combined with an intuitive reading can be a cleansing experience on the energetic level and empowering on the emotional level, as it employs a holistic approach to promote a more balanced, more peaceful, more fulfilling life. Erica Onofrio is owner of Soul to Soul, located in Ocean City, NJ. A Reiki Master and natural born intuitive, channel, and medium, Erica builds a bridge between the seen and unseen worlds with the intention of promoting healing on the deepest levels within. With a limit of 8 participants and a 90 minute time slot we believe each participant will receive ample personalized attention. Randee Mateo is part of our Sunstone yoga teaching team. With her kind, compassionate approach to yoga along with her vast experience as an occupational therapist, Randee is truly a teacher for “all”. Investment: $35 early bird / $45 at door.